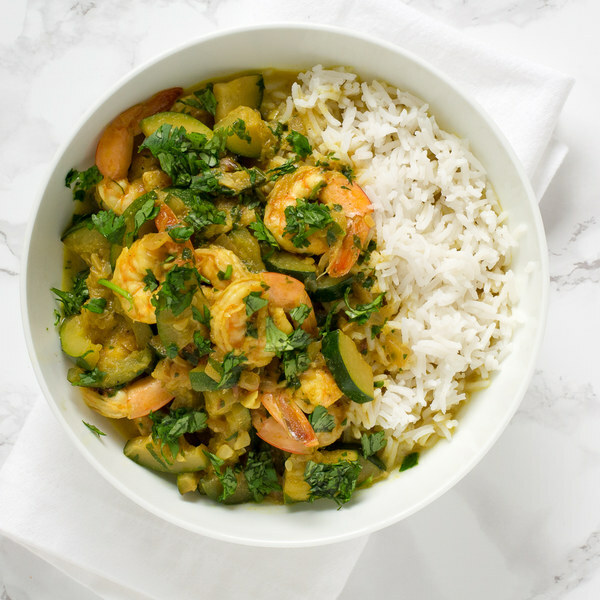 ← Shrimp & Zucchini Coconut Curry with Basmati Rice. If using frozen shrimp, place them in a colander and run under cold water until there are no more ice chunks. Then, lay them out on a clean towel or paper towels and pat dry. If using fresh shrimp, skip the first step. Preheat a sauté pan over medium-high heat. Once the pan is hot, add coconut oil and swirl to coat the bottom. While the onion cooks, trim off and discard the ends of the zucchini; quarter the zucchini lengthwise, then slice crosswise into ¼-inch-thick pieces. Add the zucchini to the pan; cook, stirring occasionally, until slightly softened, 2 to 3 minutes. While the zucchini cooks, trim off and discard the root ends of the garlic; peel and mince or press the garlic. Transfer to a small bowl. Peel and grate or mince the ginger. Add to the bowl with the garlic. Add the garlic, ginger, curry powder, turmeric, salt, and pepper to the pan; cook, stirring, until fragrant, 15 to 30 seconds. Add the coconut milk, and fish sauce to the pan; bring to a boil, then reduce the heat to medium-low and cook for 2 to 3 minutes. Using a knife, shave the cilantro leaves off the stems at a downward angle, working away from your body; discard the stems and finely chop the leaves. Add the shrimp and ¾ of the cilantro (save the rest for garnishing) to the pan; cook until the shrimp are opaque and pink, 3 to 4 minutes, then remove from the heat. To serve, divide the rice between bowls, top with the shrimp and zucchini curry, and garnish with the remaining cilantro. Enjoy!